Adel Abdul Mahdi was sworn in with only a partial cabinet after lack of consensus on key ministries. 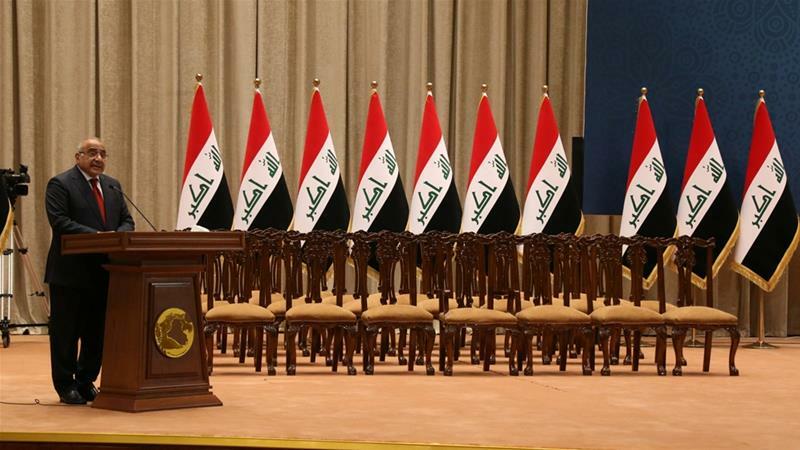 Iraq's new Prime Minister Adel Abdul Mahdi was sworn in on Wednesday but could not announce the full cabinet after legislators failed to reach a consensus on key postings, including interior and defence. But legislators from Moqtada al-Sadr's bloc Sairoon, Abadi's Nasr Alliance, Vice President Iyad Allawi's Wataniya, and Sunni Muslim blocs left the room before voting due to disagreements. "We decided to withdraw from the session, because we are not satisfied with the rest of the cabinet candidates," said Nasr legislator Ali Sined. "It's enough to approve 14 ministers." Under Iraq's constitution, Shia, Sunnis, Kurds and other minorities must all be represented. Parliament will reconvene on November 6 to vote on the remaining eight ministers, Speaker Mohammed al-Halbousi said. The unruly parliamentary session underscored the difficulties faced by Abdul Mahdi, 76, as he seeks to build consensus over his cabinet. The new prime minister faces the daunting task of rebuilding much of the country after a devastating war against Islamic State of Iraq and Levant (ISIL, also known as ISIS), as well as solving acute economic problems and power and water shortages. Ghadhban replaced Jabar al-Luaibi, who was recently made head of the new National Oil Company. He helped resuscitate a flagging oil industry after the US-led invasion of Iraq that toppled Saddam Hussein in 2003. On Wednesday, however, some legislators accused proposed ministers of being former Saddam stalwarts, or corrupt. Under a de facto power-sharing agreement, Iraq's presidency is now traditionally held by a Kurd, the prime ministership by a Shia and the parliament speaker is a Sunni.